Władysław Eugeniusz Sikorski (Polish pronunciation: [vwaˈdɨswaf ɕiˈkɔrskʲi]; May 20, 1881 – July 4, 1943) was a Polish military and political leader. Prior to the First World War, Sikorski established and participated in several underground organizations that promoted the cause of the independence of Poland from the Russian Empire. He fought with distinction in the Polish Legions during the First World War, and later in the newly created Polish Army during the Polish–Soviet War of 1919 to 1921. In that war he played a prominent role in the decisive Battle of Warsaw (1920). In the early years of the Second Polish Republic, Sikorski held government posts, including serving as Prime Minister (1922 to 1923) and as Minister of Military Affairs (1923 to 1924). Following Józef Piłsudski's May Coup of 1926 and the installation of the Sanacja government, he fell out of favor with the new régime. During the Second World War, Sikorski became Prime Minister of the Polish Government in Exile, Commander-in-Chief of the Polish Armed Forces, and a vigorous advocate of the Polish cause in the diplomatic sphere. He supported the reestablishment of diplomatic relations between Poland and the Soviet Union, which had been severed after the Soviet pact with Germany and the 1939 invasion of Poland — however, Soviet leader Joseph Stalin broke off Soviet-Polish diplomatic relations in April 1943 following Sikorski's request that the International Red Cross investigate the Katyń Forest massacre. In July 1943, a plane carrying Sikorski plunged into the sea immediately after takeoff from Gibraltar, killing all on board except the pilot. The exact circumstances of Sikorski's death have been disputed and have given rise to a number of conspiracy theories surrounding the crash and his death. Sikorski had been the most prestigious leader of the Polish exiles, and his death was a severe setback for the Polish cause. Sikorski was born in Tuszów Narodowy, Galicia, at the time part of the Austro-Hungarian Empire. He was the third child in his family; his father was Tomasz Sikorski, a school teacher; his mother was Emilia Habrowska. His grandfather, Tomasz Kopaszyna Sikorski, had fought and been wounded at the Battle of Olszynka Grochowska in the November Uprising, during which he received the Virtuti Militari medal. Sikorski attended the gimnazjum in Rzeszów (now Konarski's High School in Rzeszów) from 1893 to 1897, then transferred for a year to a Rzeszów teachers' college. In 1899 he attended the Lwów Franciszek Józef Gymnasium, and in 1902 he passed his final high school exam there. 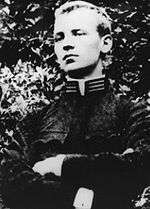 Starting that year, young Sikorski studied engineering at the Lwów Polytechnic, specializing in road and bridge construction, and graduated in 1908 with a diploma in hydraulic engineering. In 1906 Sikorski volunteered for a year's service in the Austro-Hungarian army and attended the Austrian Military School, obtaining an officer's diploma and becoming an army reserve second lieutenant (podporucznik rezerwy). In 1909 he married Helena Zubczewska, whom he met while at the high school in Lwów. In 1912 they had a daughter, Zofia. After graduation he lived in Leżajsk and worked for the Galician administration's hydraulic engineering department, working on the regulation of the San river, and later was involved in private enterprises related to construction, real estate and petroleum trade. During his studies at the Polytechnic, Sikorski became involved in the People's School Association (Towarzystwo Szkoły Ludowej), an organization dedicated to spreading literacy among the rural populace. Around 1904–1905 he was briefly involved with the endecja Association of the Polish Youth "Zet", and then drifted towards paramilitary socialist organizations related to the Polish Socialist Party, which was intent on securing Polish independence. He made contact with the socialist movement around 1905–1906 through the Union for the Resurrection of the Polish Nation (Związek Odrodzenia Narodu Polskiego). In 1908, in Lwów, Sikorski—together with Józef Piłsudski, Marian Kukiel, Walery Sławek, Kazimierz Sosnkowski, Witold Jodko-Narkiewicz and Henryk Minkiewicz—organized the secret Union for Active Struggle (Związek Walki Czynnej), with the aim of bringing about an uprising against the Russian Empire, one of Poland's three partitioners. In 1910, likewise in Lwów, Sikorski helped to organize a Riflemen's Association (the Związek Strzelecki), became the president of its Lwów chapter, and became responsible for the military arm within the Commission of Confederated Independence Parties (Komisja Skonfederowanych Stronnictwo Niepodległościowych, KSSN). Having a military education, he lectured other activists on military tactics. Upon the outbreak of the First World War in July 1914, Sikorski was mobilized, but through KSSN influence he was allowed to participate in the organizing of the Polish military units, rather than being delegated to other duties by the Austro-Hungarian military command. In the first few weeks of the war he became the chief of the Military Department in the Supreme National Committee (Naczelny Komitet Narodowy, NKN) and remained in this post until 1916. He was a commissioner in charge of the recruitment to the Polish Legions in Kraków, choosing this role over the opportunity to serve in the Legions as a frontline commander. On 30 September 1914 he was promoted to podpułkownik (lieutenant colonel), and soon after that he became the commander of a Legions officer school (Szkoła Podchorążych). The Legions - the army created by Józef Piłsudski to liberate Poland from Russian and, ultimately, Austro-Hungarian and German rule - initially fought in alliance with Austria-Hungary against Russia. From August 1915 there was growing tension between Sikorski, who advocated cooperation with Austria-Hungary, and Piłsudski, who felt that Austria-Hungary and Germany had betrayed the trust of the Polish people. In 1916 Piłsudski actively campaigned to have the Military Department of NKN disbanded. In July that year, Sikorski was promoted to pułkownik (colonel). Following the Act of 5th November (1916), Sikorski became involved with the Legions' alternatives, the Polish Auxiliary Corps and Polnische Wehrmacht. In June 1917 Piłsudski refused Austro-Hungarian orders to swear loyalty to the Habsburg Emperor (the "oath crisis") and was interned at the fortress of Magdeburg, while Sikorski abandoned Polnische Wehrmacht and returned to the Austro-Hungarian Army. In 1918, however, following the February Treaty of Brest-Litovsk and the battle of Rarańcza, Sikorski chose belatedly to side with Piłsudski, announcing solidarity with his actions, protesting against planned separation of Chełm Land from the planned Polish state, and thus soon joined Piłsudski in internment (he would be held in Dulfalva (Dulovo)). Nonetheless, this was not enough to smooth the differences between him and Piłsudski, and these two major Polish leaders would drift farther apart in the continuing years. In 1918 the Russian, Austro-Hungarian and German empires collapsed, and Poland once again became independent, but the borders of the Second Polish Republic were not fully determined and unstable. In the east they would be formed in the escalating conflicts among Polish, Ukrainian, Lithuanian and Soviet forces in what culminated in the Polish–Soviet War (1919–1921). Winston Churchill commented: "The war of giants has ended, the wars of the pygmies began." Bolshevik leaders saw Poland as a bridge that the communist revolution will have to force to bring communism to the West, and Poland's very existence would soon be at stake. After his release from internment, from 1 May 1918 Sikorski worked for the Regency Council, organizing the new Polish Army. He was soon at the frontlines again, this time in the Polish–Ukrainian War, where troops under his command secured and defended Przemyśl in October–November 1918. Polish independence came in November 1918 with the formation of the Second Republic of Poland. In the course of the Polish–Ukrainian War, and in the opening phase of the Polish–Soviet War, Sikorski, now a high-ranking officer of the Polish Army was involved in further operations in the Galicia region. In January 1919 he commanded troops defending Gródek Jagielloński; in March that year he commanded an infantry division, advancing to Stawczany and Zbrucz. From 1 August 1918 Sikorski commanded the Polesie Group, and the Polish 9th Infantry Division. In order to curtail excesses of the forces under his command, he oversaw trials of 36 officers. His forces took Mozyr and Kalenkowicze in March 1920, and he would command the Polesie Group during Poland's Kiev offensive in April 1920, advancing to Dniepr river and Chernobyl region. On April 1 that year he was promoted to brigade general. As the Polish–Soviet War grew in intensity, in late April 1920 the Red Army of Russia's new Soviet regime pushed back Polish forces and invaded Poland. Subsequently Sikorski successfully defended Mozyr and Kalenkowicze until 29 June, but later failed to hold the Brest fortress, although he defended it long enough to allow the Polish forces in the region to retreat in an orderly manner. On 6 August he was named the commander of the newly formed Polish 5th Army, which was tasked with holding the front to the north of Modlin, between Narew and Wkra rivers. He distinguished himself commanding the 5th Army on the Lower Vistula front during the Battle of Warsaw. At that time Soviet forces, expecting an easy final victory, were surprised and crippled by the Polish counter-attack. During that battle (sometimes referred to as "the Miracle at the Vistula") Sikorski stopped the Bolshevik advance north of Warsaw and gave Piłsudski, the Polish commander-in-chief, the time he needed for his counter-offensive; beginning with the 15 August his forces successfully engaged the Soviet 5th and 15th Armies. After the Battle of Warsaw, from 30 August, Sikorski commanded the 3rd Army. His forces took Pińsk, and fought during the latter stages of the Battle of Lwów and the Battle of Zamość, and then after Battle of Niemen advanced with his forces toward Latvia and deep into Belarus. The Poles defeated the Soviets, and the Polish–Soviet Treaty of Riga (March 1921) gave Poland substantial areas of Belarus and Ukraine's (Kresy). Sikorski's fame was enhanced as he became known to the Polish public as one of the heroes of the Polish–Soviet War. He also kept publishing military science articles during the war itself. For his valorous achievements Sikorski was promoted to divisional general on 28 February 1921, and was awarded Poland's highest military decoration, the order of Virtuti Militari, on 15 March that year. Despite their differences, Piłsudski praised Sikorski in his reports, recommending him for Chief of the General Staff and Minister of War positions; only generals Kazimierz Sosnkowski and Edward Rydz-Śmigły received better evaluations from him. Sikorski was popular among many soldiers, and in politics, particularly appealing to Polish conservatives and liberals. On 1 April 1921 Sikorski replaced general Tadeusz Jordan-Rozwadowski as the chief of the Polish General Staff. Between 1922 and 1925 he held a number of high government offices. Based on his analysis, the Polish Council of Ministers adopted new foreign policy that would remain roughly unchanged until the late 1930s (preserving the status quo in Europe, and treating Germany and Russia as equal sources of potential threat). On 12 December 1922 he issued a general order, stressing the need for the military to stay out of politics. After the assassination of President of Poland Gabriel Narutowicz on 16 December 1922, the Marshal of the Sejm (Sejm being the Polish parliament), Maciej Rataj, appointed Sikorski prime minister. From December 18, 1922, to May 26, 1923, Sikorski served as Prime Minister and also as Minister of Internal Affairs, and was even considered as possible President. During his brief tenure as prime minister, he became popular with the Polish public and carried out essential reforms in addition to guiding the country's foreign policy in a direction that gained the approval and cooperation of the League of Nations and tightened Polish-French cooperation. He obtained recognition of Poland's eastern frontiers from the UK, France and the United States during the Conference of Ambassadors on 15 March 1923 He aided Treasury Minister Władysław Grabski's reforms aiming at curtailing inflation and reforming the currency, and supported ethnic minorities. His government nonetheless lost support in the Sejm and resigned on 26 May 1923. From 30 September 1923 to 1924 he held the post of Chief Inspector of Infantry (Generalny Inspektor Piechoty). 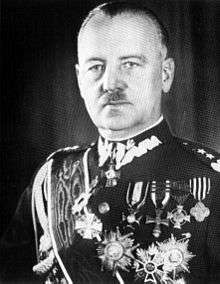 From 17 February 1924 to 1925, under Prime Minister Grabski, he was Minister of Military Affairs and guided the modernization of the Polish military; he also created the Korpus Ochrony Pogranicza. He worked actively to promote the cause of the Polish-French military alliance. His proposal to increase the powers of the Minister of Military Affairs while reducing those of the Chief Inspector of the Armed Forces met with sharp disapproval from Piłsudski, who at that time was gathering many opponents of the current government. From 1925 to 1928 Sikorski commanded Military Corps District (Okręg Korpusu) VI in Lwów. A democrat and supporter of the Sejm, Sikorski declared his opposition to Józef Piłsudski's May coup d'état in 1926; however he remained in Lwów, refused to dispatch his forces, and played no significant role in the short struggle surrounding the coup. In 1928 he was relieved by Piłsudski of his command, and while he remained on active service, he received no other posting. That year also saw the publication of his book on the Polish–Soviet War, Nad Wisłą i Wkrą. Studium do polsko–radzieckiej wojny 1920 roku (At the Vistula and the Wkra Rivers: a Contribution to the Study of the Polish–Soviet War of 1920). He would spend the following years studying military theory, publishing works on military theory, history and foreign policy. His most famous work was his 1934 book Przyszła wojna – jej możliwości i charakter oraz związane z nimi zagadnienia obrony kraju (lit. War in the Future: Its Capacities and Character and Associated Questions of National Defense, published in English in as Modern warfare. Its character, its problems in 1943), in which he predicted the return of the maneuver warfare. He wrote several other books and many articles, foreseeing, among other things, the rapid militarization of Germany. In due course, soon after he was relieved of his command, and as a semi-dictatorial Sanacja regime was established, Sikorski joined the anti-Piłsudski opposition. Sikorski largely withdrew from politics, spending much of his time in Paris, France, and working with the French Ecole Superieure de Guerre (war college). Even after the death of Piłsudski in 1935, he was still marginalized, politically and militarily, by Piłsudski's successors. In February next year, together with several prominent Polish politicians (Wincenty Witos, Ignacy Paderewski, and General Józef Haller) he joined the Front Morges, an anti-Sanacja political grouping. In the days before Poland was invaded by Germany in September 1939, and during the invasion itself, Sikorski's request for a military command continued to be denied by the Polish Commander in Chief, Marshal Edward Rydz-Śmigły. Sikorski escaped through Romania to Paris, where on 28 September he joined Władysław Raczkiewicz and Stanisław Mikołajczyk in a Polish government-in-exile, taking command of the newly formed Polish Armed Forces in France. Two days later, on September 30, president Raczkiewicz called him to serve as the first Polish prime minister in exile. On 7 November he became Commander in Chief and General Inspector of the Armed Forces (Naczelny Wódz i Generalny Inspektor Sił Zbrojnych), following Rydz-Śmigły's resignation. Sikorski would also hold the position of the Polish Minister of Military Affairs, thus uniting in his person all control over the Polish military in war time. During his years as prime minister in exile, Sikorski personified the hopes and dreams of millions of Poles, as reflected in the saying, "When the sun is higher, Sikorski is nearer" (Polish: "Gdy słoneczko wyżej, to Sikorski bliżej"). At the same time, from early on he had to work to reconcile the pro- and anti-Piłsudski's factions. His government was recognized by the western Allies. Nonetheless Sikorski's government struggled to get its point of view heard by France and the United Kingdom. The western Allies refused to recognize the Soviet Union as an aggressor, despite the Soviet invasion of Poland on 17 September 1939. Furthermore, he struggled to secure resources needed to recreate the Polish Army in exile. Poland, even with its territories occupied, still commanded substantial armed forces: the Polish Navy had sailed to Britain, and many thousands of Polish troops had escaped via Romania and Hungary or across the Baltic Sea. Those routes would be used until the end of the war by both interned soldiers and volunteers from Poland, who jocularly called themselves "Sikorski's tourists" and embarked on their dangerous journeys, braving death or imprisonment in concentration camps if caught by the Germans or their allies. With the steady flow of recruits, the new Polish Army was soon reassembled in France and in French-mandated Syria. In addition to that, Poland had a large resistance movement, and Sikorski's policies included founding of the Związek Walki Zbrojnej (Union of Armed Struggle), later transformed into Armia Krajowa (Home Army), and creation of the Government Delegation for Poland position, to supervise the Polish Underground State in occupied Poland. The Fall of France weakened Sikorski's position, and his proposal to consider building a new Polish army in the Soviet-occupied territories led to much criticism from within the Polish community in exile. On 19 July Raczkiewicz dismissed him from his position as the Prime Minister, replacing him with August Zaleski, however within days pressure from Sikorski's sympathizers, including the British government, made Raczkiewicz reconsider his decision, and Sikorski was reinstated as the Prime Minister on 25 July. One of Sikorski's political goals was the creation of a Central and Eastern European federation, starting with the Polish-Czechoslovakian confederation. He saw such an organization as necessary if smaller states were to stand up to traditional German and Russian imperialism. That concept, although ultimately futile, gained some traction around that time, as Sikorski and Edvard Beneš from the Czechoslovak government-in-exile, signed an agreement declaring the intent to pursue closer cooperation on 10 November that year. On 24 December 1940 Sikorski was promoted to generał broni. In March 1941 he visited the United States; he would visit USA again in March and December 1942. Following the German invasion of the Soviet Union ("Operation Barbarossa") in June 1941, Sikorski opened negotiations with the Soviet ambassador to London, Ivan Maisky, to re-establish diplomatic relations between Poland and the Soviet Union, which had been broken off after the Soviet invasion of Poland in September 1939. In December that year, Sikorski went to Moscow with a diplomatic mission. 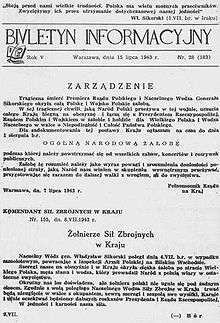 The Polish Government reached an agreement with the Soviet Union (the Sikorski-Maisky Pact of 17 August 1941), confirmed by Joseph Stalin in December of that year. 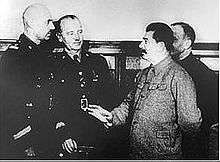 Stalin agreed to invalidate the September 1939 Soviet-German partition of Poland, declare the Russo-German Molotov-Ribbentrop Pact of August 1939 null and void, and release tens of thousands of Polish prisoners-of-war held in Soviet camps. Pursuant to an agreement between the Polish government-in-exile and Stalin, the Soviets granted "amnesty" to many Polish citizens, from whom a new army (the Polish II Corps) was formed under General Władysław Anders and later evacuated to the Middle East, where Britain faced a dire shortage of military forces. The whereabouts of thousands more Polish officers, however, would remain unknown for two more years, and this would weigh heavily on both Polish–Soviet relations and on Sikorski's fate. Initially, Sikorski supported the Polish–Soviet rapprochement, which reignited criticism of his person from some Polish factions. Nonetheless, Sikorski soon realized that the Soviet Union had plans for Polish territories, which would be unacceptable to Polish public. The Soviets began their diplomatic offensive after their first major military victory in the Battle of Moscow, and intensified this policy after the battle of Stalingrad, showing less and less regard for their deals with Poland. In January 1942 British diplomat Stafford Cripps informed General Sikorski that while Stalin planned to extend Polish borders to the west, by giving Poland Germany's East Prussia, he also wanted to considerably push Poland's eastern frontier westwards, along the lines of the Versailles concept of the Curzon Line, and acquire Lwów and Wilno, if not both. Sikorksi's stance on eastern borders was not inflexible; he noted in some documents that some concessions might be acceptable, however, giving up both Lwów and Wilno was not. In 1943 the fragile relations between the Soviet Union and the Polish government-in-exile finally reached their breaking point when, on April 13, the Germans announced via the Katyn Commission the discovery of the bodies of 20,000 Polish officers who had been murdered by the Soviets and buried in Katyn Forest, near Smolensk, Russia. Stalin claimed that the atrocity had been carried out by the Germans, while Nazi propaganda orchestrated by Joseph Goebbels successfully exploited the Katyn massacre to drive a wedge between Poland, the Western Allies and the Soviet Union. The Soviet Union, and subsequently Russia, did not acknowledge responsibility for this and similar massacres of Polish officers until the 1990s. When Sikorski refused to accept the Soviet explanation and requested an investigation by the International Red Cross on April 16, the Soviets accused the government-in-exile of cooperating with Nazi Germany and broke off diplomatic relations on April 25. Beginning in late May 1943, Sikorski began visiting Polish forces stationed in the Middle East. In addition to inspecting the forces and raising morale, Sikorski was also occupied with political matters; around that time, a conflict was growing between him and General Władysław Anders, as Sikorski was still open to some normalization of Polish–Soviet relations, to which Anders was vehemently opposed. On 4 July 1943, while Sikorski was returning from an inspection of Polish forces deployed in the Middle East, he was killed, together with his daughter, his Chief of Staff, Tadeusz Klimecki, and seven others, when his plane, a Liberator II, serial AL523, crashed into the sea 16 seconds after takeoff from Gibraltar Airport at 23:07 hours. The crash was attributed to cargo on the plane shifting to the back upon takeoff. Only the pilot, Eduard Prchal (1911–1984), survived the crash. Sikorski was subsequently buried in a brick-lined grave at the Polish War Cemetery in Newark-on-Trent, England on 16 July that year. Winston Churchill delivered a eulogy at his funeral. On 14 September 1993, his remains were exhumed and transferred via Polish Air Force TU-154M, and escorted by RAF 56 Sqn Tornado F3 jets, to the royal crypts at Wawel Castle in Kraków, Poland. Immediately after the crash, a Polish officer who had witnessed the event from the airstrip began sobbing quietly and repeating: "This is the end of Poland. This is the end of Poland." ("To Polska stracona!") General Sikorski's death marked a turning point for Polish influence amongst the Anglo-American allies. No Pole after him would have much sway with the Allied politicians. Sikorski had been the most prestigious leader of the Polish exiles and his death was a severe setback for the Polish cause. After the Soviets had broken off diplomatic relations with Sikorski's government in April 1943, in May and June Stalin had recalled several Soviet ambassadors for "consultations": Maxim Litvinov from Washington, Fyodor Gusev from Montreal, and Ivan Maisky from London. While Churchill had been publicly supportive of Sikorski's government, reminding Stalin of his pact with Nazi Germany in 1939 and their joint attack on Poland, in secret consultations with Roosevelt he admitted that some concessions would have to be made by Poland to appease the powerful Soviets. The Polish–Soviet crisis was beginning to threaten cooperation between the western Allies and the Soviet Union at a time when the Poles' importance to the western Allies, essential in the first years of the war, was beginning to fade with the entry into the conflict of the military and industrial giants, the Soviet Union and the United States. The Allies had no intention of allowing Sikorski's successor, Stanisław Mikołajczyk, to threaten the alliance with the Soviets. No representative of the Polish government was invited to the Tehran Conference (28 November – 1 December 1943) or the Yalta Conference (4–11 February 1945), the two crucial events in which the Western Allies and the Soviet Union discussed the shape of the post-war world and decided on the fate of Poland. Only four months after Sikorski's death, in November 1943, at Tehran, Churchill and Roosevelt agreed with Stalin that the whole of Poland east of the Curzon Line would be ceded to the Soviets. 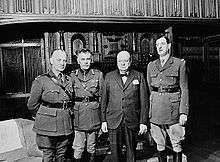 In Teheran, neither Churchill nor Roosevelt objected to Stalin's suggestion that the Polish government in exile in London was not representing Polish interests; as historian Anita Prażmowska noted, "this spelled the end of that government's tenuous influence and raison d'être." After the Teheran Conference, Stalin decided to create his own puppet government for Poland, and a Committee of National Liberation (PKWN) was proclaimed in the summer of 1944. The Committee was recognized by the Soviet Government as the only legitimate authority in Poland, while Mikołajczyk's Government in London, was termed by the Soviets an "illegal and self-styled authority." Mikołajczyk would serve in the Prime Minister's role until 24 November 1944, when, realizing the increasing powerlessness of the government in exile, he resigned and was succeeded by Tomasz Arciszewski, "whose obscurity", in the words of historian Mieczysław B. Biskupski, "signaled the arrival of the government in exile at total inconsequentiality." Stalin soon began a campaign for recognition by the Western Allies of a Soviet-backed Polish government led by Wanda Wasilewska, a dedicated communist with a seat in the Supreme Soviet, with General Zygmunt Berling, commander of the 1st Polish Army in Russia, as commander-in-chief of all Polish armed forces. By the time of the Potsdam conference in 1945, Poland has been relegated to the Soviet sphere of influence; an abandonment of the Polish government in exile that has led to the rise of the Western betrayal concept. A number of poems dedicated to Sikorski have been written by Polish authors during the war. In its aftermath, in the People's Republic of Poland, Sikorski's historic role, like that of all the adherents of the London government, would be minimized and distorted by propaganda, and those loyal to the government-in-exile would be liable to imprisonment and even execution. In time, restrictions on discussing Sikorski began to ease; on a centennial anniversary of his birth in 1981, commemorative events were held on the Rzeszów Voivodeship, including an academic conference, and revealing of plaques in Nisko and Leżajsk. Ryszard Zieliński published a novel on him, Wejście w mrok (1971), and in 1983 a movie, Katastrofa w Gibraltarze by Bohdan Poręba, was made. The Polish government-in-exile, of which Sikorski was the first Prime Minister, would continue in existence until the end of communist rule in Poland in 1990, when Lech Wałęsa became the first post-communist President of Poland. On 17 September 1993 a statue of Sikorski, sculpted by Wiesław Bielak, was revealed in Rzeszów. 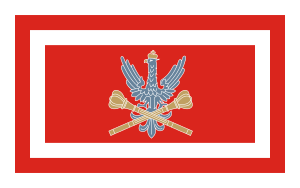 In 1995, Sikorski became the patron of the newly formed Polish 9th Mechanized Brigade. 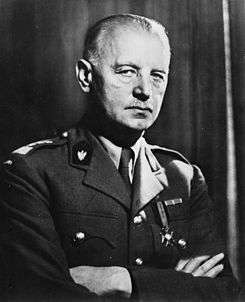 In 2003, the Polish parliament (Sejm) declared the year (60th anniversary of Sikorski's death) to be the "Year of General Sikorski". A number of streets and schools in Poland bear Sikorski's name. 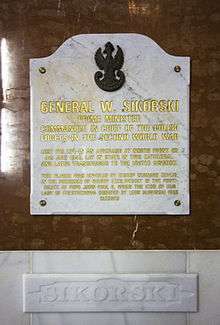 Memory of General Sikorski was also preserved both in Poland and abroad, by organizations like the Sikorski Institute in London. In the UK, Sikorski received honoris causa degrees from the University of Liverpool and University of St Andrews. In 1981, a commemorative plaque was revealed at Hotel Rubens in London, where during the war Polish Military Headquarters, including Sikorski's office, were located. 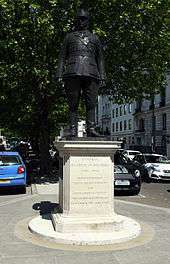 He is commemorated in London's Portland Place, near the Embassy of Poland, with a larger than life statue, unveiled in 2000. A propeller from the plane in which he died is the centrepiece of a new memorial to Sikorski at Europa Point, Gibraltar. A British Court of Inquiry convened on July 7 that year investigated the crash of Sikorski's Liberator II serial AL 523, but was unable to determine the cause, finding only that it was an accident and "due to jamming of elevator controls", noting that "it has not been possible to determine how the jamming occurred but it has been established that there was no sabotage.". The Polish government refused to endorse this report, due to the contradiction about the cause not being determined but sabotage being ruled out. The political context of the event, coupled with a variety of curious circumstances, immediately gave rise to numerous speculation that Sikorski's death had been no accident, and may have been the direct result of a Soviet, British, or even Polish conspiracy. Some modern sources still note that the accident is not fully explained; for example Jerzy Jan Lerski in his Historical Dictionary of Poland (1996), entry on the "Gibraltar, Catastrophe of", notes that "there are several theories explaining the event, but the mystery was never fully solved." However, as Roman Wapiński noted in his biographical entry on Sikorski in the Polish Biographical Dictionary in 1997, no conclusive evidence of any wrongdoing has been found, and Sikorski's official cause of death is listed as an accident. In 2008 Sikorski was exhumed and his remains were examined by Polish scientists, who in 2009 concluded that he died due to injuries consistent with an air crash, and that there was no evidence that Sikorski was murdered, ruling out theories that he was shot or strangled before the incident; however they did not rule out the possibility of sabotage, which is still being investigated by the Polish Institute of National Remembrance. As of 2012, the investigation continues. Regulamin musztry Związku Strzeleckiego i elementarna taktyka piechoty (Drill Regulations of the Riflemen's Association and Basic Infantry Tactics), 1911. Nad Wisłą i Wkrą. Studium do polsko–radzieckiej wojny 1920 roku (At the Vistula and the Wkra Rivers: a Contribution to the Study of the Polish–Soviet War of 1920), 1923; latest edition, Warsaw, 1991. Przyszła wojna – jej możliwości i charakter oraz związane z nimi zagadnienia obrony kraju (War in the Future: Its Capacities and Character and Associated Questions of National Defense), 1934; translated into French in 1934, and into English in 1943; latest edition Warsaw, MON, 1972. Generał Władysław Sikorski: Publicystyka generała Władysława Sikorskiego na łamach Kuriera Warszawskiego w latach 1928–1939 (General Władysław Sikorski: Articles by General Władysław Sikorski in the Warsaw Courier, 1928–1939), Oficyna Wydawnicza Aspra, 1999, ISBN 83-908937-3-8.
a ^ For a detailed analysis of the size of Polish forces, in comparison to other allies, see note a in the Polish contribution to World War II article. ↑ Olgierd Terlecki (1976). Generał ostatniej legendy: rzecz o gen. Władysławie Sikorskim. Polonia Bookstore and Publishers Co. p. 7. Retrieved 7 October 2012. ↑ Thaddeus M. Piotrowski (9 January 2007). Poland's Holocaust: Ethnic Strife, Collaboration With Occupying Forces and Genocide in the Second Republic, 1918–1947. McFarland. p. 3. ISBN 978-0-7864-2913-4. Retrieved 13 November 2012. ↑ Adrian Hyde-Price (23 June 2001). Germany and European Order: Enlarging NATO and the EU. Manchester University Press. p. 75. ISBN 978-0-7190-5428-0. Retrieved 13 November 2012. ↑ Peter J. Boettke (30 September 1990). The Political Economy of Soviet Socialism: the Formative Years, 1918–1928. Springer. pp. 92–93. ISBN 978-0-7923-9100-5. Retrieved 13 November 2012. 1 2 3 Andrew Hempel (8 November 2005). Poland in World War II: An Illustrated Military History. Hippocrene Books. p. 26. ISBN 978-0-7818-1004-3. Retrieved 7 November 2012. ↑ Robert Gretzyngier (24 July 1998). Polish Aces of World War 2. Osprey Publishing. p. 13. ISBN 978-1-85532-726-9. Retrieved 7 November 2012. ↑ Gregor Dallas (30 September 2005). 1945: The War That Never Ended. Yale University Press. p. 54. ISBN 978-0-300-10980-1. Retrieved 7 November 2012. ↑ Steven Zaloga (21 January 1982). The Polish Army 1939–45. Osprey Publishing. p. 15. ISBN 978-0-85045-417-8. Retrieved 13 November 2012. ↑ Walter Lipgens (1985). Documents on the history of European integration: Plans for European union in Great Britain and in exile, 1939–1945 (including 107 documents in their original languages on 3 microfiches). Walter de Gruyter. p. 648. ISBN 978-3-11-009724-5. Retrieved 10 August 2011. ↑ Piotr Stefan Wandycz (1980). The United States and Poland. Harvard University Press. pp. 245–246. ISBN 978-0-674-92685-1. Retrieved 10 August 2011. 1 2 Anna M. Cienciala; N. S. (Natal'ia Sergeevna) Lebedeva (2007). Katyn: A Crime Without Punishment. Yale University Press. pp. 210–211. ISBN 978-0-300-10851-4. Retrieved 7 November 2012. ↑ Zawodny, Janusz K. (1962). Death in the Forest: The Story of the Katyn Forest Massacre. University of Notre Dame Press. ISBN 0-268-00849-3. ↑ Russia to release massacre files. BBC News, December 16, 2004. Retrieved on 2007-10-27. ↑ Tadeusz A. Kisielewski (January 2005). Zamach: Tropem zabójców Generała Sikorskiego. Rebis. pp. 169–170. ISBN 978-83-7301-767-2. Retrieved 8 November 2012. 1 2 Michael Alfred Peszke (2005). The Polish Underground Army, The Western Allies, And The Failure Of Strategic Unity in World War II. McFarland. p. 102. ISBN 978-0-7864-2009-4. Retrieved 8 November 2012. 1 2 3 4 Mieczysaw B. Biskupski (2000). The History of Poland. Greenwood Publishing Group. pp. 117–118. ISBN 978-0-313-30571-9. Retrieved 7 November 2012. ↑ Grzegorz Ostasz, The Polish Government-in-Exile's Home Delegature. Article on the pages of the London Branch of the Polish Home Army Ex-Servicemen Association. Retrieved 4 April 2011. ↑ Anita Prażmowska (1995). Britain and Poland, 1939–1943: the betrayed ally. Cambridge University Press. p. 191. ISBN 978-0-521-48385-8. Retrieved 8 April 2011. ↑ Peter D. Stachura (2004). Poland, 1918–1945: An Interpretive and Documentary History of the Second Republic. Psychology Press. p. 177. ISBN 978-0-415-34358-9. Retrieved 7 November 2012. 1 2 Jerzy Jan Lerski (1996). Historical Dictionary of Poland, 966-1945. Greenwood Publishing Group. p. 160. ISBN 978-0-313-26007-0. Retrieved 8 November 2012. ↑ Marc Trachtenberg (1999). A Constructed Peace: The Making of the European Settlement, 1945–1963. Princeton University Press. p. 13. ISBN 978-0-691-00273-6. Retrieved 7 November 2012. ↑ Herbert Agar (15 August 1957). The Price of Power: America Since 1945. University of Chicago Press. p. 43. ISBN 978-0-226-00937-7. Retrieved 7 November 2012. ↑ "What Lech Walesa did". Economist.com. 1990-09-22. Retrieved 2009-01-02. ↑ Michael Alfred Peszke (2005). The Polish Underground Army, The Western Allies, And The Failure Of Strategic Unity in World War II. McFarland. p. 45. ISBN 978-0-7864-2009-4. Retrieved 7 November 2012. ↑ "Time to lay the hero's ghost". Telegraph. Retrieved 2012-11-07. ↑ "Dedication of the new memorial to General Sikorski at Europa Point". Gibnews. 4 July 2013. Retrieved 9 July 2013. ↑ Michael Alfred Peszke (2005). The Polish Underground Army, The Western Allies, And The Failure Of Strategic Unity in World War II. McFarland. p. 103. ISBN 978-0-7864-2009-4. Retrieved 8 November 2012. ↑ Thom Burnett (November 2006). Conspiracy Encyclopedia. Franz Steiner Verlag. p. 47. ISBN 978-1-84340-381-4. Retrieved 8 November 2012. ↑ Nicholas Atkin; Michael Biddiss; Frank Tallett (8 March 2011). The Wiley-Blackwell Dictionary of Modern European History Since 1789. John Wiley & Sons. p. 389. ISBN 978-1-4051-8922-4. Retrieved 8 November 2012. ↑ Professor Norman Davies (26 August 2008). No Simple Victory: World War II in Europe, 1939–1945. Penguin. p. 165. ISBN 978-0-14-311409-3. Retrieved 8 November 2012. ↑ "No evidence Polish hero murdered". BBC News. January 29, 2009. Retrieved 2013-04-29. ↑ "IPN ujawnił jak zginął Sikorski". Tvn24.pl. 2009-01-29. Retrieved 2012-11-09. ↑ "Śledztwo ws. śmierci gen. Sikorskiego przeniesione z Katowic do Warszawy". Wiadomosci.gazeta.pl. Retrieved 2012-11-09. ↑ Polskapresse Sp. z o.o. "Przełom w sprawie tajemniczej śmierci gen. Władysława Sikorskiego?". Wiadomosci24.pl. Retrieved 2012-11-09. Generał Sikorski, premier, naczelny wodz (General Sikorski: Prime Minister, Commander in Chief), London, Polish Institute and Sikorski Museum, 1981, ISBN 0-902508-09-1. Wikimedia Commons has media related to Władysław Sikorski. Captain Kazimierz DUDA - 1st Polish Armoured Division - C.K.M.